Berry and Chocolate Martini Sundae - Frozen Frappe Fun! With all the fresh raspberries at the farmer's market I decided to do my Berry Chocolate Frappe Martini for dessert last night - except I did it with a bit of a twist! I replaced the half and half with 2-1/2 Cups of vanilla ice cream and added 1 cup of frozen raspberries then blended it all together, poured it into a stainless steel bowl, covered it with saran wrap and froze it. Then I poured the Creme de Cacao and the Berry Vodka into a small bowl, added 1 Cup of good chocolate syrup and blended this together, covered it too and refrigerated it. I left out the vanilla vodka and the half and half as the ice cream brings these flavor profiles into play. 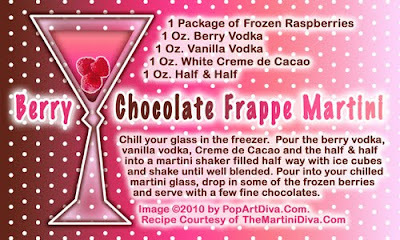 I chilled my 2 martini glasses in the freezer as well and when my raspberry ice cream was set up, I scooped it into my chilled martini glasses, poured the chocolate berry sauce over the top, garnished them with a few fresh raspberries and some chocolate shavings and served up my martini with a spoon!